For nearly fifty years, Airbus and Boeing have owned a duopoly of the mid-range, narrow-body commercial jet market, with their A320 and 737 series of aircraft. But recently, a new competitor has emerged in hopes of staking a claim in this broad and lucrative market. 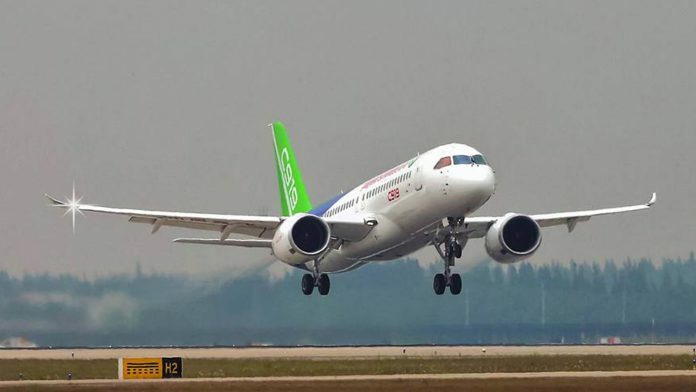 In May, Chinese manufacturer COMAC flew their new C919 for the first time. It spent an hour and 19 minutes aloft, with a crew of five aboard. COMAC stands for Commercial Aircraft Corporation of China, Ltd. The C919 is roughly the size of the two planes it’s competing against; the Airbus A320 and the Boeing 737-800. It will hold 168 passengers, putting its cabin capacity at about the same size as well. China and the ASEAN region account for the fastest-growing segment for aviation in the world. Boeing estimates that China will need over 5,100 C919-sized planes over the next 20 years. The C919 has received 570 orders so far, (primarily from Chinese airlines) but did not receive any at this year’s Paris Air Show in June, while Boeing and Airbus each gained hundreds. China isn’t a complete stranger to aircraft building. Airbus already has a final assembly line for the A320 in Tianjin. If you know your planes, you’ll see a lot of similarity between the A320 and C919. COMAC is also building a smaller “regional” jet, the ARJ21. The ARJ21 just received its production certificate to allow mass production earlier this month, even though it first flew in 2008. In comparison, Boeing and Airbus usually begin mass producing their newly-designed jets within about 18 months of their first roll-out from the factory. The C919 has been in development since 2007. China Eastern is expected to be the first airline to have it in their fleet. When it enters service, it will be about two years delayed from its original development timeline. You can’t blame COMAC for taking things slowly. They want to get things right the first time, and to be fair, we’ve seen Airbus and Boeing each suffer lengthy program delays with recent new aircraft, such as the Airbus A380 and Boeing 787. For China, the C919 program isn’t just about building airplanes. It’s about bringing themselves closer to the forefront of an industry in which they have already been contributing for many years.